Microbeads bills made great progress in the CT General Assembly in 2015, but a final bill was unfortunately not called by the senate prior to adjournment. However, due to the quick thinking of Connecticut legislators, language from the HB 5286 microbeads ban - which contained suggestions we made in testimony to close loopholes - was introduced in the state budget bill, and passed (General Assembly bill 1502, section 50). 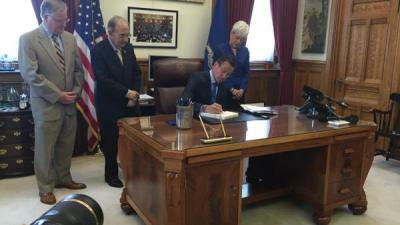 Governor Malloy signed the budget into law on June 30, 2015. Proposed Bill No. 5403, Act Prohibiting The Sale Of Personal Cosmetic Products That Contain Microbeads. Proposed Bill No. 5727, An Act to ban microbeads from personal care products sold in the state. The intents of the bills were good but the original bills needed strengthening to close industry loopholes. Our efforts here were successful; the deliberative session on the bills included mention of our testimony, and the final version of the combined bill closed the most significant loopholes that would have allowed manufacturers to skirt around the law and continue to pollute our waters with these needless, nasty plastic beads. Unfortunately, while the House passed the bill without any objection, the Senate failed to call the bill before session adjourned on June 3, 2015. This means that the good bill with our amendments died. However, due to the quick thinking of legislators, language from the HB 5286 microbeads ban was introduced in the state budget bill, and passed (General Assembly bill 1502, section 50). This bill calls for a phase out of sale and manufacture of microbeads in CT. Fortunately, the bill maintains our requested amendment to the industry-backed definition of plastic, removing the limiting and inaccurate language that other states have passed, creating a loophole. "Microbead" means any intentionally added synthetic solid plastic particle measured to be five millimeters or less in size that is used to exfoliate or cleanse and is intended to be rinsed off or washed off the body and consequently deposited into a sink, shower or bathtub drain. The budget bill also allows for manufacturers of microbeads products that contain so-called "biodegradable" plastic beads to submit an application before August 15, 2016, to pursue a study on the environmental impacts of their products to the environment or publicly owned treatment works in CT. The purpose of the study would be to determine if an actual biodegradable microbead is available for use that would not be detrimental to water systems and the environment. Under this provision, applicants would also be required to disclose the chemical constituents or composition of their so-called “ biodegradable” microbeads. (C) study committee meetings that afford the opportunity for such applicant, department and interested persons to obtain information concerning the study's process. The Academy is directed to complete any such study and issue a final study report to the Commissioner by December 15, 2017. If a study is not completed on or before December 15, 2017, the manufacturing, selling, importing or offering for sale of any personal care product that contains an intentionally added biodegradable microbead shall be prohibited on and after July 1, 2018. The inclusion of a microbeads ban in the state budget is GREAT news for Connecticut! YOU can help by never buying products that contain plastic microbeads (learn more here) and writing to your CT legislators to thank them for support of a microbeads ban (find contact info here). Becoming a member of our Chapter is also a great way to support our work on this important issue. Email for more information: ct@surfrider.org. For more information please contact our Northeast Regional Manager, Melissa Gates.